The Solvay Conference, founded by the Belgian industrialist Ernest Solvay in 1912, was considered a turning point in the world of physics. Located in Brussels, the conferences were devoted to outstanding preeminent open problems in both physics and chemistry. 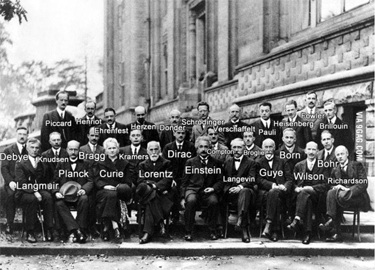 The most famous conference was the October 1927 Fifth Solvay International Conference on Electrons and Photons, where the world’s most notable physicists met to discuss the newly formulated quantum theory. The leading figures were Albert Einstein and Niels Bohr. Einstein, disenchanted with Heisenberg’s uncertainty principle, remarked “God does not play dice”. Bohr replied: “Einstein, stop telling God what to do”. 17 of the 29 attendees were or became Nobel Prize winners, including Marie Curie, who alone among them, had won Nobel Prizes in two separate scientific disciplines.